01010069 MAGIC FOREST PENDANT NECKLACE. Re-Cyclos Magic Forest Collection takes certain existing fragments of the Lladró classic creations and evolves them into stunning contemporary classics. Gold-plated jewels with 18 karat gold on sterling silver (925 0/00), with white matt porcelain elements handmade and hand polished. This piece of Lladro Jewellery is brand new and in perfect condition. It is made in Spain and comes in the original Lladro Box. The item is of perfect quality, (we do not sell seconds). We are an authorised Lladro stockist and are one of the largest distributors in the United Kingdom. All prices are quoted in Pounds sterling. Please note that Lladro items are dispatched within 10-14 days of placing your order. If there is a delay, we will contact you as soon as possible. We reserve the right to make corrections on any item. We will not process any orders where an error has occurred. 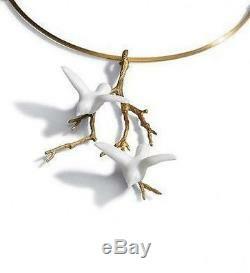 The item "LLADRO Porcelain Jewellery MAGIC FOREST PENDANT NECKLACE #01010069" is in sale since Monday, April 11, 2016.